Anyone else hear the crickets chirping over on the blog front here?? I have a few fun projects and photos I have lined up to share here. As I say every time, I'm hoping to make this more regular, but I really mean it this time! I have a lot of fun things up my sleeve as well as new products and I can't wait to share all of this with you guys. I've been selling work over on my Society6 shop now for a year and a half. I love the quality of the products created by Society6 so much, and wouldn't be selling so much of my work their if this wasn't true. Everything I have seen printed from them has been so phenomenal, from the shirts to the pillow cases, tote bags, mugs, wall clocks, etc. I love the ever expanding product list. Check out their YouTube page for some great videos showing the production process for multiple different products, including this one about the production of the phone cases as well as this one about how to put your phone into the tough case, which really showcases the two pieces. I was SO ecstatic when I found out that Society6 was going to offer "tough" cases. The only reason I had been buying my personal phone cases elsewhere was because the idea of a slim case scares my constantly-dropping-my-phone accident prone self. I just love that for a mere $3 more, you can get a case with protective rubber as opposed to the snap on plastic case only. (Don't get me wrong, those are fantastic, I just know myself and that is NOT a good idea for me personally). As you can see in the photos above, the phone case comes in two pieces, which is so rad. There is bumper (the black piece shown in the photo on the left) and then a plastic shell. The bumper doesn't go on the back of the case which is what keeps the case so seriously slim, and the pieces fit together super snug. In the photos above here, I tried to give an idea of the slim profile this case gives, and the seriously incredible quality of the printing. There IS a raised bumper edge from the black rubber piece, which I love since it gives a little insurance to the safety of the glass screen. I think this photo showcases the real amazing quality of the printing for the case. I put it right on top of the original painting to show that the color matching is seriously incredible. FLAWLESS. When I first unpacked the case I couldn't stop staring. I mean really, you can see the texture of the watercolor paper on the case. It's unreal. I couldn't be happier to be offering so many phone cases through Society6 and I couldn't think of a better company to have phone cases through. The quality is unbeatable. I hope you'll check out my other phone cases on there, and maybe you'll see one that suits your style! Here is a direct link to the phone case that I have pictured in this post. OH! 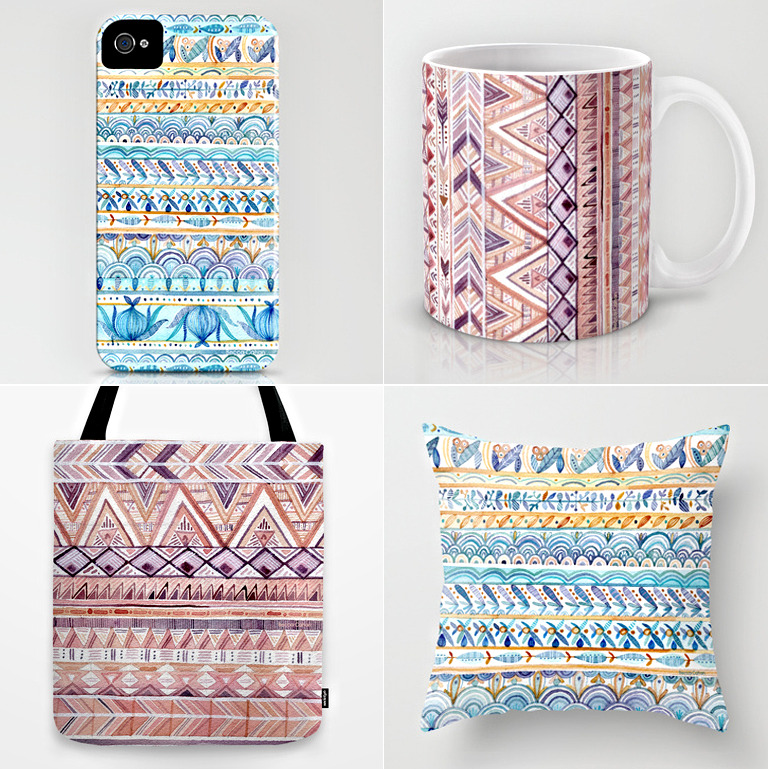 And society6 is offering a FREE WORLDWIDE SHIPPING* promotion right now through SUNDAY February 22, get on that! No code necessary! *Super sadly, free shipping excludes framed art prints, stretched canvases, rugs, and clocks. But everything else is a go! Full disclosure: Some of the links used above are affiliate links but all opinions are mine!